Discussion in 'Canadian Stocks Message Boards' started by TheDude, Apr 4, 2018. AXM has caught a bounce after retracement action. My U.S. version, AXMIF, has not bounced yet however. That is likely because the USD has been weakening against the CAD. Thanks for posting that chart. The pullback over January has been a good buying opportunity for those that wanted to add or an entry position before the company advances forward in the spring here with acquiring the gold property again, along with a large scale JV partner. We will also see Senegal royalty payments next month via the Teranga Gold financials. Gold at $1330 today, nice to see it on an uptrend. CENTRAL AFRICA: THE PRESIDENT OF THE REPUBLIC RECEIVED HE MR CHEN DONG, AMBASSADOR OF THE PEOPLE'S REPUBLIC OF CHINA. The President of the Republic, His Excellency Faustin Archange Touadera received in audience early in the afternoon of January 29, 2019, His Excellency Chen Dong, Ambassador Extraordinary and Penitentiary of the People's Republic of China near the Central African Republic. The strengthening of bilateral cooperation between China and the Central African Republic was at the center of this meeting. Returning from China, His Excellency Chen Dong is carrying a message from the Chinese Government to His Excellency Faustin Archange Touadera. For the Chinese diplomat, this meeting with President Touadera made it possible to take stock of the various activities carried out in the Central African Republic in the framework of bilateral cooperation for the year 2018 as well as the projects on the agenda of the year 2019. The Chinese diplomat Chen Dong also said that during the China-Africa summit in Beijing, President Touadera has sought multiform support of China. These supports, he says, concern the education, agriculture and security sector. This meeting with President Touadera was an opportunity to plan the implementation of these various projects during this year. Keep in mind that every area in Sounkounku and Bransan Lot-B has a 1.5% NSR for AXM. If you look at the 2017 43-101, there has been around 80,000m total of drilling, along with bulk sampling and work done on all the targets, more so on the stuff close to Gora. Targets 7,11,13,19,52 are all within 5km of Gora and with the infrastructure already there, makes sense to put them into production. Dude, what do you mean by 1.5% NSR for AXM? 1.5 Net Smelter Royalty. Any production from anywhere on the claim (even beyond the 17 targets) has a 1.5% royalty attached to that gold. Central African Republic's government has initialed a peace deal with 14 armed groups following more than a week of talks in Sudan's capital. President Faustin Archange Touadera is attending Tuesday's ceremony in Khartoum along with his Sudanese counterpart, Omar al-Bashir, and a representative of the African Union. The agreement represents rare hope for the impoverished, landlocked nation where religious and communal fighting has continued since 2013. Thousands of people have been killed and hundreds of thousands displaced. Details of the peace deal have not been announced, but Sudan's state media have reported that it focuses on power-sharing and transitional justice. The United Nations has warned that the fighting in Central African Republic has carried a high risk of genocide. Scores of mosques have been burned. Religious leaders have been killed. KHARTOUM (UrduPoint News / Sputnik - 05th February, 2019) Noureddine Adam, leader of a faction from the former Seleka - the Popular Front for the Renaissance of the Central African Republic (FPRC) - told Sputnik Tuesday that Russia would monitor the implementation of the peace deal between the Central African Republic's (CAR) authorities and armed groups. The CAR president and armed groups earlier in the day initialed the peace deal between government representatives and 14 armed groups at talks in Khartoum. "Russia will monitor the implementation of the agreement and will support the agreement's guarantor states," Adam said. He said the agreement included the formation of a united army and security forces. BANGUI, Central African Republic (AP) — An agreement signed by Central African Republic and 14 rebel groups earlier this week will see the dissolution of armed groups, the formation of an inclusive government and the creation of a fund for victims who have suffered in years of conflict, according to the accord seen Friday. The deal signed Wednesday is the eighth since the fighting began in 2013 but the first to emerge from direct dialogue. The 30-page peace pact, negotiated in Sudan and titled the Political Accord for Peace and Reconciliation, evokes four main points: victims, justice, peace and national reconciliation. The agreement says that armed groups will undertake to respect the legitimacy of the country’s institutions, and to renounce the use of arms and violence against the defense and security forces, U.N. personnel and humanitarian workers. They also agree to refrain from any act of destruction, occupation of public buildings, place of worship and violence against the civilian population, as well as acts of sexual or gender-based violence. In exchange, armed groups are able to create political parties. The government, meanwhile, will monitor the agreement and analyze the reintegration of the leaders of armed groups who formerly served as civil servants or military. The government is also committed to set up a Truth, Justice, Reparation and Reconciliation Commission within 90 days, cutting short the idea of amnesty long negotiated by armed group leaders. The signatories also undertake to set up mixed security units that will include elements of the defense and security forces as well as ex-combatants after training. This means that armed groups will dissolve their movement and help facilitate the return of the authority of the state and to participate in disarmament, demobilization, reintegration and repatriation within two months. 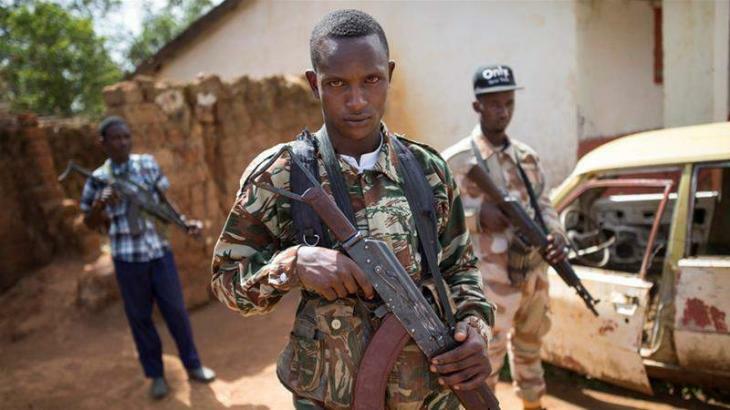 Armed groups currently control around 80 percent of Central African Republic, and President Faustin Archange Touadera, in power since 2016, has struggled to stabilize the country as armed groups compete over lands rich in gold, diamonds and uranium. The major conflict in Central African Republic began in 2013 when predominantly Muslim Seleka rebels seized power in Bangui. Largely Christian anti-Balaka militias fought back. Rebels continue to carry out deadly attacks on displaced people’s camps and other communities. The African Union, which oversaw the negotiations that began on Jan. 24 in Khartoum, has expressed optimism about the agreement. Vancouver, British Columbia--(Newsfile Corp. -February 12, 2019) - AXMIN Inc.(TSXV: AXM) ("AXMIN" or the "Company") notes the following news release. OnSaturday February 2, 2019 the Government of the CAR announced on social media that an agreement for peace had been made at the talks taking place in Khartoum. The Government stated that the agreement would be initialed on Sunday February 3, 2019 and thereafter it was signed in Bangui onFebruary 6th. An immediate cessation of violence by the armed groups against defense and security forces, UN personnel, humanitarian workers and the general population. The armed groups will respect the legitimacy of the CAR's institutions and will disband. The Government will analyse the reintegration of the leaders of the armed groups who previously served as civil servants or in the military. The Government will set up a Truth, Justice, Reparation and Reconciliation Commission within 90 days. The parties to the agreement will undertake to set up mixed security units that will include both the defense and security forces as well as former members of the armed groups. A Prime Minister will be appointed drawn from a representative of the former armed groups. The former armed groups will have the right to start political parties without hindrance. … I am humbled to announce that with the exemplary cooperation I received from both the Government of the CAR(@GouvCF) and the 14 armed groups, we have secured a#peaceagreementtodayin the interest of the people of#CAR. Separately onThursday January 31, 2019 the United Nations Security Council voted unanimously on a resolution drafted by France that provides for a road map to lift the arms embargo on the CAR. This resolution states that the Council will establish requisite benchmarks byApril 30, 2019 and will assess progress on these benchmarks byJuly 31, 2019. The Council will then review the arms embargo measures bySeptember 30,2019. The resolution welcomes 'the significant efforts made by the CAR authorities' to advance security sector reform, including by developing a national defense plan and national security policy. This resolution acknowledged 'the urgent need for the CAR authorities to train and equip their defense and security forces to be able to respond proportionately to threats to the security of all citizens in the CAR.' The Council stated that it had granted several exemptions to allow shipments of weapons from France, Russia, China, the United States and Belgium for the CAR's army. AXMIN is delighted to hear that a peace agreement has been reached in Khartoum and hope that this agreement will be honored and bring security and stability to the CAR. The Company believes that the combination of the agreement together with the eventual lifting of the arms embargo should provide both the framework for stability and also the effective method of enforcement by equipping and deploying the military forces of the Government of the CAR. We look forward to being back on site and working on developing the Passendro asset as soon as conditions allow in the near future. A further press release regarding the security situation in Ndassima, the location of the Company's Passendro asset, will be made when appropriate to do so. I'm pleased, my AXMIF is nearly a double. Haha, not a bad day at all. Might see a small pullback next week because it ran. But long term, we get on that gold deposit with the JV and it will keep going up. "Ah, you know, strikes and gutters, ups and downs...the Dude abides". This was a strike for sure. Thanks for your coverage on this stock as the story unfolds. I suppose it will retrace some...try to retest the breakout at 30 cents maybe. I'll be looking for a spot, where it refuses to go lower, to add to my AXMIF position (US OTC offering of its Canadian mother, AXM). Hey no problem, our patience and belief is paying off for sure. I spoke to many shareholders this weekend and all of them realized we went up way more than expected. I was happy with a 30-31 close for friday and we far exceed that. A pullback is most likely to happen, but it should setup a consolidation range in the 30's which will jump us into the 40-50 range in a couple weeks. (Business in Cameroon) - Timber export conditions at the port of Douala, Cameroon’s economic capital, have been improving since the beginning of the year, the International Tropical Timber Organization (ITTO) noted. However, despite this upturn which is the result of a slowdown in Chinese demand, ITTO said, some timber exporters now ship cargoes through the deep-water port of Kribi, commissioned in March 2018 in the southern region. In a memo covering the period Feb.1-15, 2019, ITTO revealed that despite the improvement situation at the port of Douala, “exporters of sawn timber and logs to the Central African Republic shipped their cargoes through the port of Kribi”. “It is logical that part of the traffic from the port of Douala should be redirected to the port of Kribi. This will allow to ease traffic,” Patrice Melom, MD of the autonomous port of Kribi (PAK), said at the end of a seminar held April 19-20, 2018 with players of the timber sector to discuss ways to carry out export activities within the Kribi port platform. Wood exports at the Kibri port are carried out by Kribi Containers Terminal (KCT), a company controlled by the Franco-Chinese consortium Bolloré-CHEC-CMA CGM in partnership with the Chinese shipowner Cosco. This junior gold stock rose 60% in 2019! From Wendy Zhang why pennies should be included in your portfolio , we have mentioned that junior mining companies are a very important category, although most of the junior mining companies’ stocks are in a state of low trading and price all the year round, but grasp At several specific points in time, investing in junior mining companies can still quickly achieve ultra-high returns, which is unmatched by other types of stocks. In the current trend of resource market, many companies are expected to rise, especially as gold prices are optimistic, gold mining stocks are worth looking forward to. Recently, Toronto-based gold primary exploration company AXMIN (TSXV: AXM ) stocks are amazing (with photos), doubling the gains in four trading days, bringing investors a gratifying return. AXMIN is principally engaged in the exploration and development of gold projects located in Africa. In fact, in the past 2018, the company's share price has been launched from the bottom, and the stock price has nearly doubled in the whole year. That is to say, if an investor holds AXMIN stock in early 2018, its assets have been turned over. Ten times, this is an impossible income for ordinary stock investment. Moreover, all of this happened when the company's news was relatively calm, indicating that the source of the increase was not the company's public relations hype, but the changes in the relevant environment and the improvement of the company's own cash flow. In the interview, David Weill, the company's chief financial officer, mentioned three main factors driving the stock price increase: First, benefit from the flow of royalties generated by the company's Gora deposit jointly developed by Teranga Gold (TSX:TGZ) in Senegal, the company's The cash flow is excellent and the profit of the accounting accounts is realized. The company also has 17 potential deposits developed with Teranga that are expected to generate more revenue for the company. For the wonderful original content, please click "Read the original"